Carl C. Anderson, Sr. and Marie Jo Anderson Foundation Rehabilitation Center is equipped with enhanced space and equipment. The new sensory gym offers large, wide-open floor spaces for both indoor and outdoor therapy. The rehabilitation therapy pool is custom-designed to challenge both those with neuromuscular concerns and athletes with sports injuries. It has a variety of depths that range from six inches to six feet to accommodate children of all heights. 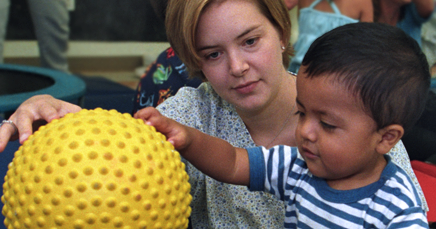 Dell Children’s Pediatric Therapy Program is a special place for children that offers evaluation and treatments to enable them to reach their full potential, physically, cognitively and socially. We treat both inpatients from Dell Children’s and outpatients, upon referral from local pediatricians and specialists. The new sensory gym provides occupational, physical and speech therapy services. Staff work closely with a range of pediatric specialists such as orthopedic surgeons, neurologists, physiatrists, developmental specialists, oncologists, neurosurgeons, pediatricians and hospitalists. Sports medicine and hand therapy. For the convenience of the kids in our care, therapy is offered for all disciplines in Spanish.